Les sons learned from a campus lockdown. CHALLENGE: Communicate rapidly and reliably with students, staff, & visitors wherever they are located in the event of a crisis or lockdown. 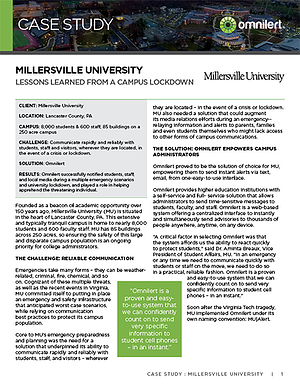 RESULTS: Successfully notified students, staff, & local media during a multiple emergency scenarios and university lockdown, and apprehended the threatening individual.